1st printing. 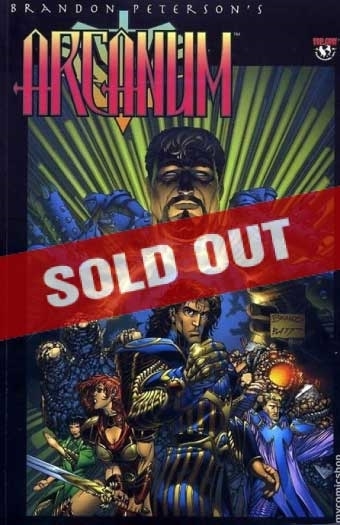 collects Arcanum (1997 Image) #1-8 and Arcanum (1997) 1/2. Story and art by Brandon Peterson. Armageddon is coming. Which side will you choose? Writer/artist Brandon Peterson (Ultimate X-Men) enters the world of Arcanum and discover the "Avatars," human beings who have become the living manifestations of War, Love, Death...and more. Split into two factions, the forces for goodness struggle to stop the machinations of an ancient being with the knowledge of how to destroy the world. CIncludes 16 pages of bonus materials by Brandon Peterson! Softcover, 240 pages, full color. Cover price $16.99.